Yates County is a county located in the U.S. state of New York. As of the 2010 census, the population was 25,348. The county seat is Penn Yan. The name is in honor of Joseph C. Yates, who as Governor of New York signed the act establishing the county. Yates county is included in the Rochester, NY Metropolitan Statistical Area. When counties were established in New York State in 1683, the present Yates County was part of Albany County. This was an enormous county, including the northern part of New York State as well as all of the present State of Vermont and, in theory, extending westward to the Pacific Ocean. This county was reduced in size on July 3, 1766 by the creation of Cumberland County, and further on March 16, 1770 by the creation of Gloucester County, both containing territory now in Vermont. In the years prior to 1776, most of the Loyalists in Tryon County fled to Canada. In 1784, following the peace treaty that ended the American Revolutionary War, the name of Tryon County was changed to honor the general, Richard Montgomery, who had captured several places in Canada and died attempting to capture the city of Quebec, replacing the name of the hated British governor. On January 27, 1789, 10,480 square miles (27,140 km2) of Montgomery County was split off to create Ontario County, including the lands of the present Allegany, Cattaraugus, Chautauqua, Erie, Genesee, Livingston, Monroe, Niagara, Orleans, Steuben, Wyoming, and Yates counties, and part of Schuyler and Wayne counties. On March 18, 1796, 1,800 square miles (4,700 km2) of Ontario County was partitioned to form Steuben County. On April 3, 1801, Ontario County exchanged land with Cayuga County, and lost 190 square miles (490 km2) as a result. On March 30, 1802, Ontario County lost 6,540 square miles (16,940 km2) of land through the partition of Genesee County, including the present Allegany, Cattaraugus, Chautauqua, Erie, Niagara, Orleans and Wyoming counties and parts of Livingston and Monroe counties. In 1821, Ontario County was reduced in size by combining portions of Genesee and Ontario counties to create Livingston and Monroe counties. On February 5, 1823, Yates County was formed from 310 square miles (800 km2) of Ontario County, including the area that included Vine Valley, Middlesex, Penn Yan, and Dresden, New York. On January 1, 1826, 60 square miles (160 km2) of Steuben County was partitioned and added to Yates, which included Starkey, Dundee, and Lakemont, New York. On April 15, 1828, 10 square miles (26 km2) was partitioned from Yates, and passed to Seneca and Tompkins counties, mostly in the forest. On March 17, 1860, Ontario County was authorized to gain land from Yates, but it was never put into effect. On April 18, 1946, Yates gained 10 square miles (26 km2) from Schuyler and Senaca counties, which produced the current borders of Yates County. 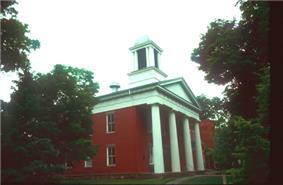 Yates County is in the western part of New York State, northwest of Ithaca and southeast of Rochester. It has a total area of 376 square miles (970 km2), of which 338 square miles (880 km2) is land and 38 square miles (98 km2) (10%) is water. Yates County is in the Finger Lakes Region. As of the census of 2000, there were 24,621 people, 9,029 households, and 6,284 families residing in the county. The population density was 73 people per square mile (28/km²). There were 12,064 housing units at an average density of 36 per square mile (14/km²). The racial makeup of the county was 97.90% White, 0.56% African American, 0.15% Native American, 0.28% Asian, 0.02% Pacific Islander, 0.36% from other races, and 0.74% from two or more races. Hispanic or Latino of any race were 0.93% of the population. 21.3% were of English, 16.5% German, 11.4% Irish, 10.7% American, 5.3% Danish and 5.3% Italian ancestry according to Census 2000. 5.46% report speaking Pennsylvania German, German, or Dutch at home; a further 1.54% speak Spanish. There were 9,029 households out of which 31.50% had children under the age of 18 living with them, 56.00% were married couples living together, 9.40% had a female householder with no husband present, and 30.40% were non-families. 24.60% of all households were made up of individuals and 11.60% had someone living alone who was 65 years of age or older. The average household size was 2.59 and the average family size was 3.08. In the county the population was spread out with 26.70% under the age of 18, 9.30% from 18 to 24, 24.70% from 25 to 44, 23.90% from 45 to 64, and 15.50% who were 65 years of age or older. The median age was 38 years. For every 100 females there were 95.30 males. For every 100 females age 18 and over, there were 91.30 males. The median income for a household in the county was $34,640, and the median income for a family was $40,681. Males had a median income of $29,671 versus $21,566 for females. The per capita income for the county was $16,781. About 8.90% of families and 13.10% of the population were below the poverty line, including 20.90% of those under age 18 and 7.10% of those age 65 or over. The label within parentheses is the official designation. In New York State, a village is an incorporated settlement; a hamlet is an unincorporated settlement. Keuka College is in this county. Penn Yan Airport (PEO), the principal airport in the county, is on a hill south of Penn Yan.